WICKED RUN PRESS: "You can't save me now, because I belong to the Hurricane"
"You can't save me now, because I belong to the Hurricane"
I've always felt that listening to folks talk about their running injuries is pretty tedious at first, and then it quickly turns worse. Enough to make me put my pointer finger under my jaw and then shoot straight up. It's like the fantasy football geek who gives you way too much detail about all of his ten teams on a Monday morning. You are trapped in the conversation and become hostage with a fake nod and smile on your face. Well, I have a running injury, so smile and nod. Last Saturday, 15 days out from race day, I went out for a ten miler that I had to cut short at 8. It felt like all the blood was rushing into a spot in my thigh, just above the knee, which then spun in a ball size knot. The knot got thicker, bigger, and hotter, until a golfball size spinning flame of spikes was churning in my leg. I stopped the run and wandered back home, iced the spot, took five days of rest, and went out yesterday for a 6-7 miler. I stopped after the pain hit me again at mile five. 96% of my body feels perfect and is going as planned. This spot in my thigh has never hurt me before. The usual injury suspects are fine. 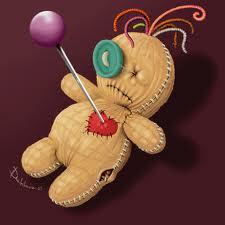 Somebody somewhere has a voodoo doll. Nobody makes it to the start of a marathon without something aching and with a perfect training plan, but I've been injury free, besides the regular days of rest needed to recover. I'm fully aware of phantom taper injuries, I get them all the time, but this phantom is real. I want to go Nancy Kerrigan and scream "Why me???" But self-pity is something I find poisonous, the opposite is gratitude. I will finish if I have to run/walk. I believe a 15 minute per mile is tops? Plus I'm leaving the first wave. They can't close the course on me. The idea of 8 days of rest taking it away is still one of my hopes, and I'm seeing my PCP who is also a marathoner, on Monday. More likely, the days of rest will give myself more miles past 5 where it starts to hurt. I plan to experience New York in its grandeur, both before and during the run. I may even turn the marathon into a photo tour and take some pictures in my expected walk breaks. I still hope to squeeze some of my guts out of me during the run, and deposit them onto the streets. Like most folks, I"m fretting if Sandy will be in town. She's supposed to be there and gone by marathon day, but like a bad house guest, hurricanes tend to arrive late and stay longer than expected. The way I see it, if its going to rain, it may as well go full-tilt hurricane (with nobody hurt, of course) with winds always in our faces, rain coming down sideways, folks leaving the course in frustration, and a whole new set of endurance tests. Okay, don't shoot yourself, I'll stop blabbing now. But first, a $1,000 reward to anyone who provides tips directly leading to the capture and arrest of the owner of the Voodoo doll ~ Or provides treatment advice that makes this whole golfball full of spikes and flames in my thigh vanish by next saturday. Sorry to hear Mark. Take care if yourself. These things have a way of working out at race day. Good luck. I'm not sure you want the hurricane there. Their talking flooding in the subway. It would be chaos when you go. SH##!! wtf?!?! but like Jeff said, take care of urself and don't count a miracle healing out of the cards yet! i've seen it happen before. do u think it could be the insertion of ur IT band perhaps?? i'll start hunting for that voodoo dude for u, and trust me there will be heck to pay! Hmmmm...wonder about the marathon with the hurricane...maybe it will be postponed...wouldn't that be fateful? !